Centsible Savings: Kroger: earn points and get up to $1.00 off each gallon of gas! 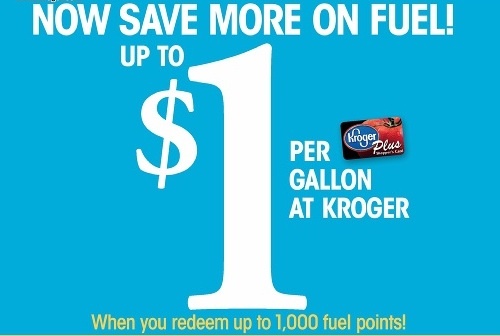 Kroger: earn points and get up to $1.00 off each gallon of gas! Kroger is changing their fuel discount program for the better! You used to only get 10¢ off a gallon (valid for 1 fill-up) for every 100 points ($100 in groceries) that you spent (before coupons! :) And if you had 300 points you had 3 separate 10¢ discounts for 3 different fill ups. Now, the points you earn + fuel discounts will add up! up to 1000 points (earned in 1 month) = $1.00 off a gallon for an entire fill up! Check out your area to make sure they are participating and terms/conditions. Here’s an idea: Buy a $50 Shell gift card at Kroger with the rest of your groceries, then use it combined with 100 points you earned from buying $100 worth of groceries to get a 20¢ discount per gallon on a single fill up!